The Merlin Award has never been without controversy. ‘Female Magician of the Year 2008’ went to Scarlett, Arian Black and Bambi Van Burch (Correction by Tony Hassini. Despite her promotional material, Scarlett received ‘Female Illusionist of the Year’). ‘Illusionist of the Decade’ went to Luis deMatos 2010, Joe Labero 2009, and Franz Harary in 2004. (Correction by Tony Hassini. Luis DeMatos got 2010-2020, Franz got 2000-2010, Joe Labero got ‘Master Showman of the Decade’). 2008 – ‘Best Stage Magician’/’Best International Stage Magician’. But one controversy that stands above the rest is that of Bambi VanBurch. Her husband Kirby VanBurch – Prince of Magic, had already won Merlin Awards for ‘Magician of the Year’ 1999 and ‘Entertainer of the Year’ 2001, and he in 2007 he received ‘Entertainer of the Year’ while Bambi was presented ‘Female Magician of the Year’ based on the illusions she was performing in the duo’s show. 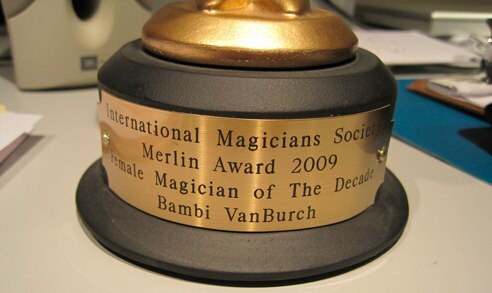 In 2008, Bambi was again awarded ‘Female Magician of the Year’ – as was Arian Black and Scarlett – Princess of Magic. (Correction, Scarlett got ‘Female Illusionist of the Year’). In 2009 Bambi branched out with a solo show as ‘Bambi VanBurch – Princess of Magic, and was awarded ‘Female Magician of the Decade’. The presentation took place on June 8 and the mayor of Branson declared it ‘Bambi VanBurch day’. Kirby was also present according to this press report. In this video clip she talks about her husband being her main teacher, and her upcoming solo show. In August Kirby posted press releases that the two were separating due to “irreconcilable differences” and the long process of divorce began. Shortly after that, a letter from Tony Hassini, President of the IMS appeared on Bambi VanBurch’s website. After some investigation Kirby said it was put up without his knowledge by a member of his staff. This letter stated that Mr Hassini had written to Kirby in June telling him that Bambi was copying other magicians presentations and must stop, and as she hadn’t, she would be stripped of her 2007 and 2008 Merlin Awards. It also said that she must stop calling herself ‘Female Magician of the Decade’ as the title was never awarded to her by the IMS. Speaking to iTricks Kirby said this was correct as his request to Tony to award her the Decade title was turned down. Page 1 of the two page letter can be viewed here – or you can see the text of page 1 at the end of this article. iTricks obtained a copy of a letter dated February 12 from Tony Hassini addressed to Kirby and congratulating Bambi on all of her awards for 2007, 2008, and 2009. Kirby said he’d never seen the letter. Mr Hassini granted her the award in a letter in February, then denied it existed in a letter in October. Kirby said she didn’t get the award, the picture “must be doctored”, yet reports say he was present at the ceremony. Mr Hassini was revoking her awards because she was using copied material in her show, despite the fact that other Merlin Award winners do too. The Oct 21 letter implies that, in June, Kirby reassured Mr Hassini that Bambi was not using copied material, yet here Kirby claims Bambi was warned against using copied material, and she continued using it regardless. Yet sources say he created her show for her. 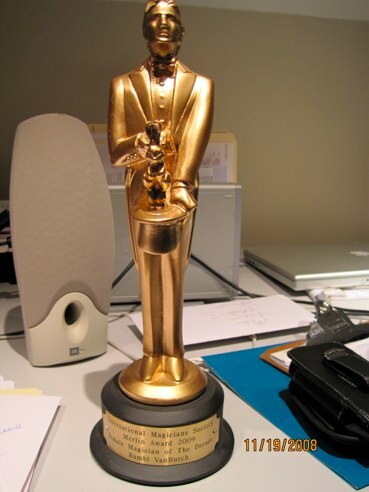 To mix things up even further, take a look at the date stamp on this photo Bambi took of her ‘Female Magician of the Decade’ award – November 19, 2008… ? The letter sent from Tony Hassini on Oct 21 to Kirby & Bambi VanBurch, which was posted on Bambi VanBurch’s website on November 17. Merlin Award for the years 2007 & 2008. The Merlin Award is one of the most prestigious honors in the world of magic. and outstanding contributions within the magician’s society. recipients of the Merlin Award. relationship, I had no reason not to believe you. the music and patter of others.